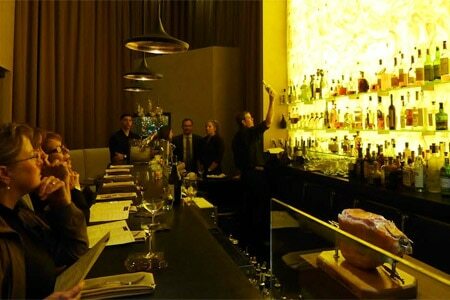 Part of the Olio Cucina restaurant group, this small spot offers crudo (Italian raw fish) as well as cooked dishes. : Olio Crudo Bar, the latest Santa Barbara restaurant from Alberto and Elaine Morello, marks a complete departure from the traditional feel of its neighboring sister establishments Olio e Limone and Olio Pizzeria. The narrow, high-ceilinged space has a modern design with a backlit, marbled wall that gives off a golden glow. There are several stools at the long bar as well as corner banquette seating and a few tall tables. Reservations are not accepted, so drop in and sample crudo (thinly sliced raw fish) like fluke with pink grapefruit, pickled Fresno chili rings, smoked almonds and organic baby greens; and hamachi carpaccio with citrus zest, spring onion, Fresno red chili and sesame-soy infused oil. Silverware and chopsticks are provided but you could also try scooping up a bite with the interesting Sardinian shepherds' flatbread. There are also cooked dishes that you won't find at the other Olio restaurants, such as delectable Mediterranean octopus with sliced new potatoes, frisée lettuce and spicy Controne pepper; the lightest ricotta dumplings with speck and creamy porcini and truffle sauce; and pressed Kurobuta pork belly with Brussels sprouts and Fuji apple chutney. End on a sweet note with the peanut butter semifreddo or nougat mousse with spicy dark chocolate. The short wine list features Italian selections along with local wineries. If you can't decide on a cocktail, you can compose your own "mini martini flight" (three for $14) from a seasonal list.